Part of being green means being in touch with nature, which isn’t always easy to do in the city. Living across from a huge park helps, as does being involved with community garden projects or tree planting initiatives. But there’s also something to be said for bringing the outside world in, which is why I’m going to get some plants. Having indoor plants should also help clean the air a bit, and supposedly they help keep things cool in the summer months. Plus, I’m hoping they’ll serve as little reminders of why I’m making all these changes. But here’s my sitch: I have absolutely no botanical knowledge whatsoever and could do with some advice as to which sort of plants I should get (and no, a marijuana plant is not an option). Also, I can’t stand spider plants or anything that needs to be hung from the ceiling. Bamboo is pretty trendy, but it’s too House & Home for me. It has to be a type that does well with minimal sunlight, and that my cat won’t eat. This entry was posted on Tuesday, August 21st, 2007 at 8:00 am and is filed under environment, gardening, plant. You can follow any responses to this entry through the RSS 2.0 feed. Both comments and pings are currently closed. Hey, I found that spathe lillies work for me. I think they’re called spathe lillies. Peace lillies are the common name. Super easy to maintain, and they typically have a big white flower. 🙂 Impossible to kill, unless you ferilize via eyeball. lol! Check your local library for a book title Plantepedia. It is a primer for houseplants, and includes lists of low-maintenance, and low-light plants, along with basics on potting, watering, fertilizing, etc. peace lilies (also called spath as luke said) are also super easy to care for and don’t need a lot of light. if it starts to droop, give it some water and it’ll come right back to life! 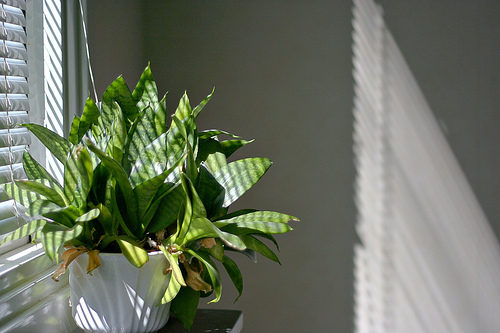 the chinese evergreen is also super easy to take care of. good luck! philodendrons are idea. they are low-maintenance, require little light, recover well when you forget to water them (wilting instead of dying like a fern), and have lovely heart-shaped leaves on vines you can drape beautifully. plus, the name means tree-lover! i was able to grow them in a basement apartment once, and my husband has a stunning one in his windowless office. Ph I can’t wait for your book to come out. That is exciting. You were also asking me about places more likely to be supportive of bringing our own containers. Fresh and Fressen both give discounts if you bring your own, and Mezzetta on St. Clair is happy to put it in your container. Check out the Trashless Toronto page on my blog under restaurants. I have a list there. Succulents are good if you give them enough sunlight. However, if you have mostly shade areas, I suggest you go to a specialty plant store like Armstrong Nurseries, where they have experts who can tell you what works best for your home and give you tips on plant care and maintenance. Can’t rave enough about the peace lily. Spathiphyllum. Here is a pic and specs. Also the Cast Iron Plant, Aspidistra. Good luck on a plant that a cat won’t eat. BTW, lilies are poisonous and cause kidney failure in cats. I think philadendron can be poisenous, too. You’ll need to check whatever plant you bring into your home for cat safety. I had good luck with aloe plants and I have a brown thumb. Spider plants! Get one and it will give you dozens more just like it 🙂 Yea, I have no idea why but I am quite fond of spider plants. Maybe it is that 1973 better housekeeping look they have or their rampant simplicity. I read somewhere that they are one of the top oxygenators also. ps: oxygenators is not a word. Wow, you guys are awesome! Shawn, I hereby declare “oxygenator” a word. It is now in the dictionary. I’m going to go look up all these plants and see what they look like and where I can find them here in Toronto. The whole thing with my cat, though, is sorta scaring me. Definitely do not need to deal with Sophie getting kidney failure. Aloe sounds like it would also be pretty useful to have around… and anything that’s called a Succulent can’t be that bad, right? Reporting back: I think the peace lillies look too much like a plant you’d find in a doctor’s waiting room (no offense, mom). The chinese evergreen seems okay but didn’t have much of a “wow” factor. Philodendrons are too dangly and messy looking for me, but I’m DEFINITELY into the jade plants, the succulents (especially the pink kind!) and the aloe — on a mission now. Hopefeully will be able to pick some up today or tomorrow and post some pics. Good point on poison concerns. This first site might help. According to the SPCA’s list, aloe plants are also toxic to cats & dogs, along with peace lilies, umbrella trees (schefflera arboricola), and mother-in-law’s tongues (all common houseplants). I have all three of the latter, but my cats don’t seem interested in eating them. A groovy grape fruit tree, or orange tree…even a peach tree….I have these potted indoors and the grape fruit tree gave us some amazing grape fruits…I’m expecting my lemon tree to start producing soon as well…They look awesome, easy to care for and produce tasty organic, edible fruit. My lemon tree and orange tree were from seeds, and my grape fruit tree I bought. I’ve also got a peach tree and cherry tree sprouting right now! I love my aloe. I’ve had it for 6 years (and I travel away for three weeks sometimes). Since then, my little aloe has become two rather large plants and three smaller plants. (Sprouts make great gifts.) I also love our “christmas cacti.” These plants are easy to maintain and fit well in our apartment. English Ivy is a good bet, very low maintenance and really pumps out the oxygen. Mums and Spider plants are similarly high oxygen producers. Ivy cuttings can be rooted in a glass of water. So one little plant can turn into lots. No need to hang it. I think the trick with house plants is to not over water. Water well, till the earth is damp, but not sopping, once a week and ignore them the rest of the time. It doesn’t list Jade, but I have seen Jade plants on other “toxic plant” lists. Might want to check with your vet before you buy the plant. Yeah, I’ve thought of that actually. I got her cat grass once, but she kept knocking the whole thing over. Then she’d eat too much of it and barf it up. Maybe I’ll try it again, or get some catnip or something so she won’t eat the aloe. I’ve had really good luck with pothos plants, which I think may be the same or similar to philodendrons. I water the ones in my office once a week and they’ve been growing luxuriantly for years! succulents! they are my fave! i adore them and can’t stop buying them! very easy to take care of – water once a week – less in the winter (more in the summer). they are so pretty! but do need sun to part shade. you can find some that need less sun than others. but my friend has a cat (who eats all plants) and she puts hers under a glass bell jar – to keep the cats from eatting them – and it looks really pretty – like a little green house garden. i think succulents and cacti are very eco friendly b/c they don’t need a lot of water – but maybe you should find out the kinds of plants that are indigenous to your area – that way what ever you buy for your house won’t have been shipped half way accros the country. One of the most efficient pollutant removers is the dragon tree (Dracaena), which may explain why its spiky variegated leaves on a tall central stem are so often seen in offices. It’s easy to care for, reaching 8ft in ideal conditions (rich soil, warmth, light shade and sparse watering, preferably not from old coffee cups). The goosefoot plant (Syngonium podophyllum), with its gloriously mottled and marbled leaves, is also extremely effective against all forms of air pollution – it needs a temperature of 60F (15C) and does best in bright, indirect light and a moist, loam-based soil. I have been going through a VERY bad experience with my older cat and thought he had a kidney problem and was dying. Little did I know he has been chewing on the Dracaena and Taro Vine plants that my roomie has around the house! If you have cats, please check online before buying new plants! I had to go through photos online of EVERY plant listed before I found out the names of them. My roomie didn’t know and neither did I.
I left out the part that the plants my roomie has around the house are all POISONOUS! My cat hasn’t eaten decently in over two weeks and looks like a skeleton. I really don’t know what to do since my roomie owns the house and plants and will not let me put them away. Any suggestions from anyone?